Posted on October 28, 2017 by Fay Curtis. 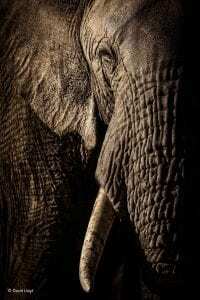 David Lloyd, The Power of the Matriarch. Now in it’s 53rd year, the world renowned Wildlife Photographer of the Year competition from the Natural History Museum is back at M Shed with 100 spectacular images. This image takes me back to 1982. 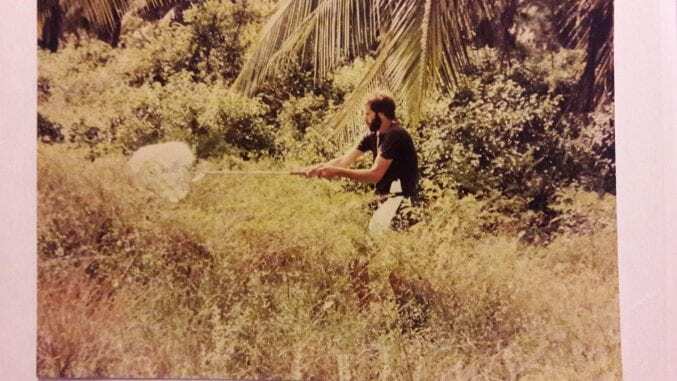 As a just graduated, naive zoology student I was the leader of a student expedition to Kenya. It was my first time in Africa and my first time managing a group of people who didn’t always see eye to eye. Black and White Colobus monkeys careered in the trees and rare herbivores such as the Sable Antelope could be glimpsed if lucky. Tracks of Leopard were common and weird and exotic invertebrates drew my attention along with the prolific bird life. However it was the elephants which really made their presence felt and one in particular. We stopped in our Land Rover near a grove of trees and this magnificent bull elephant suddenly appeared from amongst the trees ears flapping, trunk waving back and forth, stirring up dust with his feet – magnificent and intimidating. However, what struck me most was the incongruous nature of the scene as he had walked out from a grove of planted pine trees. I was used to seeing how, post-war in the UK, plantations of conifers had been created where deciduous native woodland should have stood but I had not really appreciated that a similar folly could have taken place in what seemed such a remote place. Needless to say the trees had failed as a crop and now the remnants shielded elephants. My image of Africa as this pristine Eden, already knocked as a consequence of my experiences on the coast, was now well and truly put straight, we have treated all parts of our planet in a cavalier fashion and we need to cherish what we still have. Image: Ray collecting insects for the Natural History Museum, London, by ‘sweeping’. Kenyan coast near Gazi summer 1982. Get tickets for the Wildlife Photographer of the Year exhibition and purchase a souvenir from the shop. I am trying to contact you about 2&4 Archfield Road. My daughter runs Archfield Nursery now I am retired. She has given me the wonderful task of finding out more of the History of the buildings and especially the observatory on the roof. We are wanting to be able to answer peoples’ questions on our next open day this year. Someone came along one last open day and mentioned your name. I would love to hear from you and try and find out through you some more of the history.